(LORA GAUSS/For the Gazette) A pumpkin centerpiece adorned with natural materials is easy to make. To be honest, the television special “It’s the Great Pumpkin, Charlie Brown” and perhaps a candlelit grinning Halloween jack-o’-lantern on the doorstep were all I recall of pumpkins from my youth. And, of course, pumpkin pie. Today, not only are there the traditional orange pumpkins (whose Americanized name “pumpkin” comes from the original Greek, “pepon,” meaning “large melon”), but other squashes of various green, white, blue and orange hues for decorating and eating. There are also numerous related foods including pumpkin butter, custard, bread, cookies, soup and roasted seeds. On a lark I Googled pumpkin-spice foods and was amazed to find not only the expected coffee, creamers and doughnuts, but goodies like oatmeal, frosted cereals, chocolates and candy and toaster treats. Pumpkins are fruits and members of the cucurbit family, which includes other squashes, cantaloupes, cucumbers, watermelons and gourds. They grow on annual or perennial vines under warm and moist conditions, and both male and female flowers are produced on each plant. They can grow up to be anything from tiny lightweights to mammoths of more than 2,000 pounds — a recent record. They are 90 percent water. Generally, the pumpkin field is seeded in the first couple weeks of July, and honeybees are incredibly important for the pollination process. If not enough bees are present, the plants will need to be hand pollinated. They are manually harvested any time from August to October and the fruit is stored in a cool, dry environment to keep it from spoiling. The top four pumpkin production states are Illinois, Ohio, Pennsylvania and California, with Illinois growing 90 to 95 percent of the processed pumpkins in the United States (think Libby’s brand). It’s literally the pumpkin capital. Pumpkins are believed to be American in origin because fragments of stems, seeds and fruits have been discovered in cliff dweller ruins in the southwestern United States. Remnants of some pumpkin varieties were also found in Mexico and South America. A question that often arises is whether the Colonists had pumpkin pie at the “first Thanksgiving” feast in 1621 when the newly arrived Pilgrims and the Wampanoag Indians gathered at Plymouth, in New England. The History Channel claims that the newly formed settlement had neither the butter nor the wheat needed to make a pie crust and no ovens had yet been constructed. However, by then pumpkins and other squashes were indigenous to New England, so it is possible that they improvised by hollowing out the pumpkins and filling them with milk, honey and spices to make a custard and then roasting the shells whole in hot ashes. Historians have documented that Native Americans also roasted long strips of pumpkin in an open fire, as well as flattening the strips, drying them and weaving them into mats. Today the pumpkin pie often takes center stage on the American holiday table, and the question of whether canned pumpkin or fresh makes a more delicious pie is another one of those eternal questions. This came up at a recent Ferguson Township Garden Club meeting and the members decided to do a taste test. One member made two pies — the first using canned pumpkin, and another using a pumpkin pie pumpkin (smaller and denser than carving pumpkins) — to see if we could guess which was which. Prior to sampling, the discussion turned to methods of cooking pumpkins, and many said they either baked or microwaved the chunks. We did learn to never poke holes in a pumpkin as though it’s a potato for baking. One member did that and it blew the door off her microwave. In addition, to avoid being cut while readying a pumpkin for cooking, it was recommended to take the pumpkin out to the garage and smash it onto the floor and pick up the pieces. Was there a taste difference between the canned pie and fresh? If there was, we could not tell, but perhaps this test needed more discerning palates. 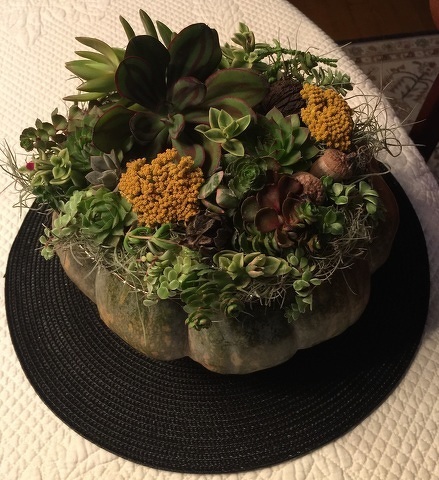 Garden notes: Here’s a great way to make your own live decorative succulent pumpkin or other squash centerpieces without cutting them. First, coat the top of a pumpkin with craft spray adhesive and press dry sphagnum moss onto the top. Then, hot glue various small live succulents, pine cones, seed pods and dried materials like yarrow to the top (strangely the succulents don’t seem to mind). Finally, elevate it slightly to eliminate moisture forming underneath (a piece of cardboard will do), and spritz the plants once a week with water to moisten the moss and hydrate any new little roots that might have formed. Treat it like a houseplant, giving it bright indirect light and sitting it by a window. It can last for months. Alas, as quickly as pumpkins appear to be everywhere, they are gone just as quickly as the calendar turns to December. When that happens, there will be even more plants and greenery to talk about when those next holidays roll around. Penn State hockey improved to 2-1 on the year with a 7-0 victory against Mercyhurst on Friday night in Erie.